​Ten Lions Clubs from the Greater Dublin area and Lions Clubs Ireland have combined to fund three sensory pods for use by autistic students at Dublin City University. Castleknock, Swords, Portmarnock, Malahide, Balbriggan, Glasnevin and Dublin. The sensory pods were unveiled at a ceremony in Dublin City University. They will be placed in locations across the University’s three campuses and will serve as designated quiet zones as part DCU’s Autism-Friendly University initiative. Each pod allows students on the spectrum to control their environment and de-stress in a calming space. The sensory pods are located on the first floor of the O'Reilly Library on the Glasnevin campus, the third floor of the Cregan Library on St Patrick’s campus and the Apple Loft on All Hallows campus. Earlier this year, DCU was recognized as the world’s first Autism-Friendly University by AsIAm, the autism advocacy charity, following an 18-month research project to better understand the challenges that may be facing autistic students. The research was carried out by researchers from AsIAm.ie and DCU’s School of Nursing and Human Sciences and the findings show that autistic students in third level often experience greater levels of difficulty settling in and adapting to university life than do their peers. Frequently cited issues were discomfort in noisy environments, difficulties in managing schedules, deadlines and workload, challenges in participating in group work and unease in new social situations and extracurricular activities. Loneliness and anxiety also featured strongly. The sensory pods will give students on the spectrum a designated space to manage their sensory environment if they are feeling overwhelmed, allowing them space to de-stress before returning to the busy pace of campus life. Claire Bohan, Director of Student Support & Development at DCU, stated: “We are so grateful to the Lions Clubs Ireland for funding this wonderful initiative for our students. The University’s campuses are vibrant spaces with lots of activity and interaction taking place, and this is so important to allow our students grow and flourish. We need, however, to be able to offer the balance of a quieter space so that students can take some time out as needs be, to allow them cope better throughout those busy days. Lions Clubs members from the Dublin area pictured at DCU for the unveiling of three sensory pods which Lions Clubs have funded. 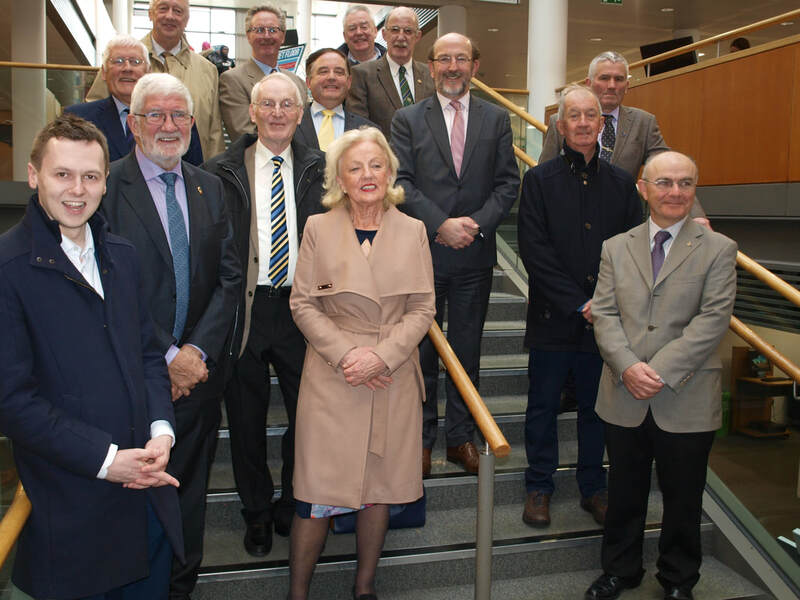 They are pictured with Adam Harris, ceo ASIAM (extreme left), Frank O’Donoghue, District Governor, Lions Clubs Ireland (second from left) and Professor Brian McCraith, President DCU (fifth from left).